Most non-mainframe IT professionals are surprised when they hear stories about how critical the mainframe still is to running business applications around the world. What really knocks their socks off is when they learn that mainframes – which some consider out of place in IT today – are being heavily relied upon for certain Third Platform workloads. Outside of mainframe operators, few people using enterprise applications today have even a vague idea that mobile applications drive enormous amounts of data back to mainframes, increasing demands on storage as well as pushing the limits of physical tape systems that tie back to mainframes. The link between First Platform infrastructure and Third Platform applications is important to a myriad of enterprise applications. Just as important is the link between tape applications and EMC’s Disk library for mainframe (DLm) that is designed to ease the growth pressure that Third Platform applications are creating for the mainframe. Seven years ago, EMC improved traditional data protection for the mainframe with high-density disk-based systems to displace tape-based backup. We’re pushing this value proposition even further with DLm 4.3, leveraging two unique concepts for Virtual Tape Libraries (VTLs): storage choice and virtual provisioning. DLm has deduplication storage based on EMC Data Domain, very fast storage based on EMC VNX and universal data consistency based on EMC VMAX. Mainframe applications traditionally used tape for online and batch overnight runs of internal application data, not data generated externally in real-time. It was perfectly acceptable (and cost effective) to store the data on physical tape. However, today’s Third Platform enterprise apps need immediate data protection and disk-like response from tape. DLm is “tape” running at disk speed. 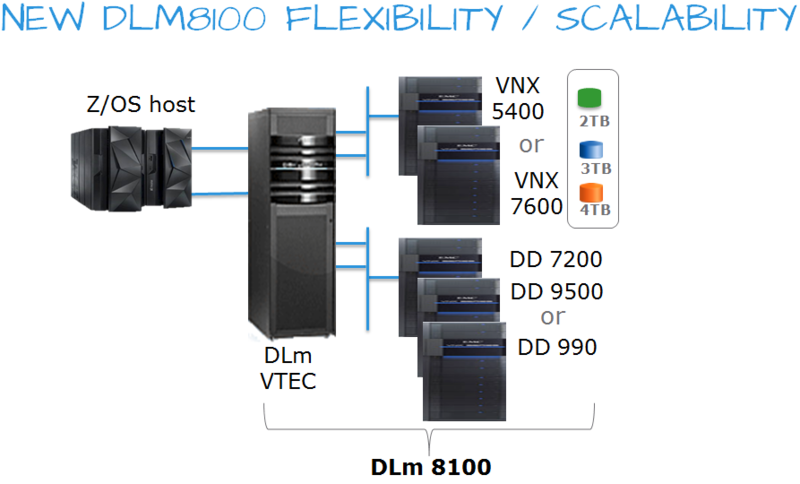 Storage density in the new DLm systems is being boosted by up to 85% via 4TB drives and virtual provisioning. These enhancements enable a capacity improvement of up to 41%, allowing users to create the largest VTL capacity available in a single system today – up to a whopping 3.1PBs – while maximizing overall DLm performance for applications like online image retrieval that require fast response times. In today’s smartphone and tablet driven-world, one simply expects that data is being immediately stored, protected and retrieved. Nobody stares at a tablet app and concludes it’s okay to wait because the data resides on physical tape. Dlm 4.3 also leverage advancements in EMC Data Domain, simplifying the configuration of protection storage for mainframe, supporting both the DD 7200 and new DD 9500 systems. For added peace of mind, we’ve added tape volume overwrite protection (WORM capability) for Data Domain-supported DLm deployments. Storage administrators have to perform Disaster Recovery (D/R) tests under tight time constraints. EMC has automated D/R test configurations for popular Data Domain storage within DLm. 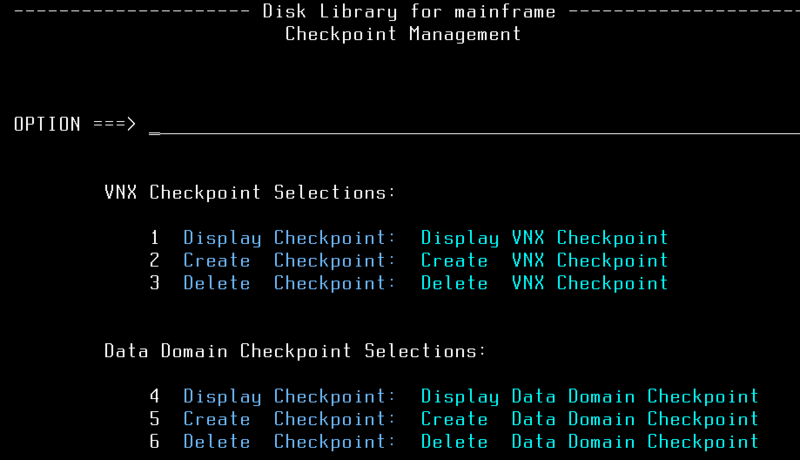 D/R test set-up of the DLm begins and ends with a simple ISPF panel. DLm is a solution for companies that have mainframe “tape” applications collecting and processing data from Third Platform applications, since EMC has the ability to match the characteristics of the use case (backup, HSM, archive, etc.) with storage optimized for these workloads. Join us at SHARE Orlando in August, to discuss DLm and VMAX DASD innovation for the mainframe. Glad to see this recognition of the mainframe\’s importance as a key business enabler. Another fun fact to put into your calculus, studies show that 68% of IT transactions are handled on the mainframe but it only takes 6% of the total IT budget. Organizations that have stayed on the mainframe are out competing organizations that migrated by a significant amount.